We are still working our way through The Chronicles of Narnia during our afternoon read-a-loud time. Today we listened to disc 1 of The Voyage of the Dawn Treader. The audio CD's have been such a help, especially with the current bugs that are making their way through our home. I scanned it in for you all to get a closer look. Didn't he do such a great job?!? My son just finished The Lion, The Witch and The Wardrobe a couple weeks ago and did his first book report, so we rented the movie and took off school and had popcorn and shakes for lunch! I DO hope you are all feeling better soon! Excellent picture! I like all of the details that your resident artist included. I pray that you are all feeling well within a day or two. My youngest daughter started vomitting last night, so our domino effect is most likely just beginning. Yes. That's a nice picture. My children love to draw while I read to them. awe, how nice! Looks like you have a budding artist too! There is something so refreshing about a kids imagination blooming into art. 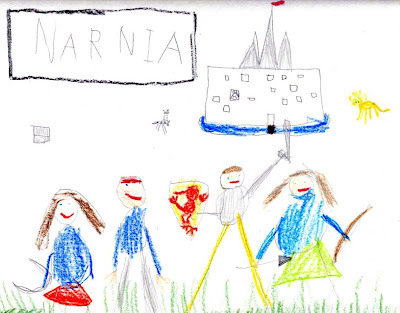 What a wonderful rendition of Narnia. Please tell Rascal I really admire his drawing. Have a great day. What a wonderful picture of Narnia. Let Rascal know how much I admire his drawing. Have a good day! I am reading to my boys (12 and 10) yup they still like their mama to read to them. I am reading Prince Caspian and we are anxiously waiting for the movie to come out on big screen. Worth the money to go see it. The shield if awesome! Great work! !